WARNING – RISK OF ELECTRIC SHOCK. CAN CAUSE INJURY OR DEATH: DISCONNECT AND/OR LOCKOUT ALL REMOTE ELECTRIC POWER SUPPLIES BEFORE SERVICING OR INSTALLING. WHEN THE SERVICE DISCONNECTING MEANS CANNNOT BE LOCKED, SECURELY FASTEN A PROMINENT WARNING DEVICE, SUCH AS A TAG TO THE SERVICE PANEL. WARNING – USE COPPER SUPPLY WIRES ONLY. WARNING – FOR GENERAL VENTILATING USE ONLY. DO NOT USE TO EXHAUST HAZARDOUS OR EXPLOSIVE MATERIALS AND VAPORS. DO NOT USE TO EXHAUST AIR LADEN WITH LINT, GREASE, OR OIL. WARNING – PRODUCT INTENDED INSTALLATION IS AN INLINE DUCT FAN WITH BOTH ENDS CONNECTED TO DUCTWORK (SEE INSTALLATION INSTRUCTIONS SECTION). FOR ANY OTHER INSTALLATION, GUARDS MUST BE INSTALLED TO PREVENT UNINTENTIONAL CONTACT WITH MOVING FAN BLADE UNLESS THE UNIT IS MOUNTED WITH THE LOWEST MOVING PARTS AT LEAST 2.4M (8FT) ABOVE FLOOR OR GRADE LEVEL. Use this unit only in the manner intended by the manufacturer. If you have any questions, contact the manufacturer. You may phone the manufacturer during normal business hours at 1-800-999-3267 or submit your questions from our website: www.suncourt.com. In-Line Duct FansTM are designed to boost dry conditioned (heated or cooled) indoor airflow in ducts of forced air systems with temperatures between 40°F (4°C) and 140°F (60°C). Suncourt accepts no responsibility for use of this product in other applications. EXPOSURE TO AIRFLOW TEMPERATURES EXCEEDING 140°F (60°C) WILL PERMANENTLY DAMAGE THE FAN AND VOID THE WARRANTY. Installation work and electrical wiring must be done by a qualified person(s) in accordance with all applicable codes and standards, including fire-rated construction and accessibility. 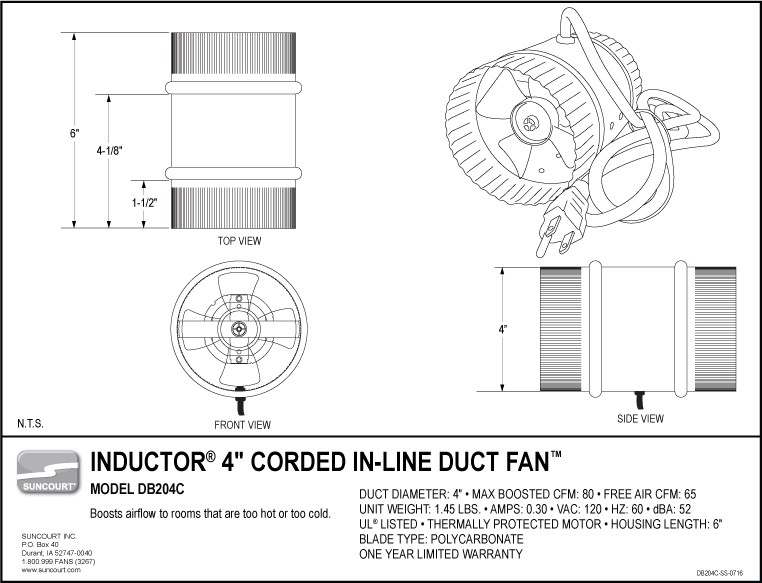 Your In-Line Duct Fan™ must be connected to a 110/120 Volt AC, 60Hz fuse or circuit breaker protected power source only in a manner approved by all applicable codes. Never connect your In-Line Duct Fan™ to a 240 Volt AC blower motor or other 240 Volt AC system. Never connect your In-Line Duct Fan™ to a variable-speed (ECM) furnace blower. For a two-speed In-Line Duct Fan™, never connect directly to multiple taps on the furnace blower; always use isolation relays. The power source must be protected by a fuse or circuit breaker rated at a minimum of 15 amperes. You may also supply power to your In-Line Duct FanTM using the Suncourt DuctStat® Temperature Sensitive Switch™ or a standard on/off switch (Purchased Separately). For In-Line Duct Fans™ without power cord attached, all connections to the power supply must be made inside the electrical box provided with the unit. Use power supply conductors and wire nuts of appropriate size and type. Attach a wire nut to any unused lead in a 2-speed In-Line Duct Fan™. The power supply wiring must always include a ground wire properly terminated at the fan (green wire). For In-Line Duct Fans™ with power cord attached, the cord can be plugged in to any standard (NEMA 5-15) 3-prong outlet. The outlet supplying power to the cord must include a ground terminal properly connected to a ground source. The power cord should be secured to a location where it is not subject to damage, abrasion, or temperatures exceeding 140°F (60°C). For maximum performance and minimum noise, the best location to install your In-Line Duct Fan™ is 6–10 feet from the register that needs the boosted air. 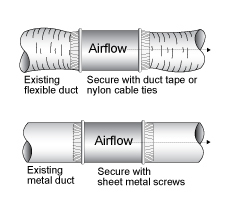 To prevent air leaks, use a good quality aluminum foil duct tape to seal the seams in the ductwork after installing the In-Line Duct Fan™. By utilizing tapered reducers, you may install larger diameter duct fans in smaller diameter ducts to achieve greater boosted airflow. Always leave your In-Line Duct Fan™ accessible for maintenance, cleaning, or repair. The In-Line Duct Fan™ can be controlled by our Ductstat® to operate the fan. This is the easiest way to interlock your In-Line Duct Fan™ to your furnace. Simply plug your fan into the Ductstat® and set the controls to operate the fan only when conditioned air is sensed inside the boosted duct. Please visit www.suncourt.com for more info on the Ductstat® Temperature Sensitive Switch™. The speed of your non-corded In-Line Duct Fan™ (models DB412E, DB414E, DB416E) can be controlled with our model VS100 Variable Speed Control. This speed control utilizes solid-state circuitry to safely adjust the fan speed without damaging the motor. The speed control mounts inside a standard 2x4 electrical box and includes a cover plate and mounting hardware. WARNING – NEVER USE A RHEOSTAT OR LIGHT DIMMER SWITCH TO CONROL YOUR FAN SPEED. A SOLID-STATE SPEED CONTROLLER MUST BE USED TO AVOID DAMAGE TO THE MOTOR. Please visit www.suncourt.com for more info on these or other accessories. 1. Locate the place in the duct where you wish to install the In-Line Duct Fan™. 2. Tape the enclosed template to the duct with the arrow pointing in the direction of the airflow. Cut out the required opening by first drilling a pilot hole and cutting along the dashed line using a jig saw or tin snips. 3. Place the Inductor® In-Line Duct Fan™ in the opening, making sure that the fan blade can turn freely. Align the arrow on the unit in the direction of airflow. 4a. Connect the spring through the middle hole provided in the base plate, stretch the spring over the duct and through the middle hole on the other side of the loose plate. Bend the ends of the spring over to secure, providing a snug installation. 4b. Secure the In-Line Duct Fan™ in position with the supplied #6 sheet metal screws using the provided holes in the base plate of the unit. 5. Finish the installation by covering the seams in the duct with a good quality aluminum foil duct tape. 1. Locate the place in the duct where you wish to install the In-Line Duct Fan™. Align arrow label on unit in direction of airflow. 2a. Simply cut the flexible duct and slide the In-Line Duct Fan™ in place by slipping the cut flexible duct ends over the crimped ends on the In-Line Duct Fan™, making sure the unit is well supported. Complete the installation by securing the In-Line Duct Fan™ to the flexible duct with a good quality aluminum foil duct tape or nylon cable ties. 2b. Remove a section of the existing ductwork and slide the In-Line Duct Fan™ in place by slipping the duct ends over the crimped ends of the unit. Complete the installation by securing the In-Line Duct Fan™ to the metal duct with the supplied #6 sheet metal screws spaced evenly around the circumference on each end of the unit. 3. Finish the installation by covering the seams in the duct with a good quality aluminum foil duct tape. 1. Locate the place in the duct where you wish to install the In-Line Duct Fan™. Align arrow label on unit in the direction of the airflow. 2a. Install connectors onto any uncrimped ends of the unit. Then simply cut the flexible duct and slide the In-Line Duct Fan™ in place by slipping the cut flexible duct ends over the connectors or crimped ends on the In-Line Duct Fan™, making sure the unit is well supported. Complete the installation by securing the In-Line Duct Fan™ to the flexible duct with a good quality aluminum foil duct tape or nylon cable ties. 2b. 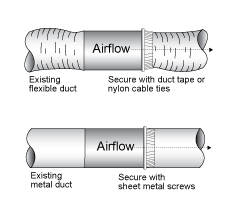 Install connectors onto any uncrimped ends of the unit, or crimp your existing ductwork. Then simply place the existing duct over the crimped ends of the unit, or the existing crimped ductwork into the unit. Secure the In-Line Duct Fan™ to the metal duct with the supplied #6 sheet metal screws spaced evenly around the circumference on each end of the unit. IMPORTANT NOTICE - In-Line Dut Fans™ without power cord attached. The motor of your In-Line Duct Fan™ may have 1 White and 1 Black wire or 2 Black wires. If you have a motor with a White and Black wire, connect the White motor wire to the White supply wire and the Black motor wire to the Black supply wire. If you have a motor with 2 black wires, connect either of the Black wires to the White supply wire and the other Black wire to the Black supply wire. Make sure you connect the colored wire as shown in the table below. Failure to connect correctly will destroy the motor. Make sure to attach a wire nut to any unused wire lead. No warranty claim for an incorrectly wired motor will be accepted by Suncourt. DB306E, DB308E and DB310E: Never connect red and black wires together! DB306E, DB308E, and DB310E: Never connect LOW and HIGH wires together. For single speed operation, select the LOW or HIGH speed wire for your application and attach a wire nut to the unused wire lead. When either the LOW or HIGH speed wire is energized there will be voltage present in the other wire. For two-speed operation you must never supply power to both LOW and HIGH speed leads simultaneously. You must isolate the power to LOW and HIGH speeds using a relay or switch. If connecting to a HVAC blower please consult with the system manufacturer or qualified HVAC contractor. Never connect to a DC blower system. Suncourt Inc. recommends that you clean your In-Line Duct Fan™ at regular intervals, similar to what is recommended for the fan of your furnace, no less than twice a year. Keep your In-Line Duct Fan™ free of lint, dust, and debris. The In-Line Duct Fan™ must never be exposed to temperatures over 140°F (60°C). Subject to the following limitations, Suncourt Inc. (manufacturer) warrants that the In-Line Duct Fan™ will, for 1 (one) year from date of original retail purchase, but not exceeding 2 (two) years from date of manufacture, remain free from appearance of defects in workmanship or materials. This warranty is subject to the following limitations: (a) manufacturer’s liability is limited to the replacement or repair of the unit, as decided by the manufacturer; (b) a defective unit must be returned, prepaid, with proof of purchase, well packaged to avoid damage in transit; and (c) this warranty does not apply to defects resulting from the alteration, abuse, accidental damage, unauthorized repair, or misuse of the unit. This warranty is given in lieu of all other warranties, guarantees, and conditions on manufacturer’s part, and the manufacturer shall have no tortious or other liability in respect to this In-Line Duct Fan™. Ship unit to Suncourt Inc. only after obtaining a Return Goods Authorization (RGA) number. Returns without this RGA number will not be accepted. Actual product appearance may differ from illustrations. Suncourt reserves the right to modify any or all of its products' features, designs, components and specifications without notice. NEVER expose your In-Line Duct Fan to airflow temperatures exceeding 140°F(60°C). Make sure all electrical wiring conforms to all applicable codes and standards. If you are not familiar with electrical installations, consult a qualified electrician. Never use an In-Line Duct Fan for dryer venting. Never connect the High and Low speed wires of a 2-speed In-Line Duct Fan together. Why do I have a room that is always too cold? Your problem room may be located far from the furnace. Friction in the long duct reduces airflow to the register in that room, thus delivery of heated air. Also, perhaps the room is over an unheated garage or the duct is simply too small (undersized) to get enough heated air to that room. Remember too, when you are delivering heated air to a room, that air has to have a way to get out of that room. Otherwise there will be no air circulation. Does the room have an air return register? If not, is the door of that room kept closed, stopping air circulation? Why do I have a room that is always too hot ? The room that you have a cooling problem with may be far away from the central air system. Long duct runs cause reduction in airflow, plus, the cooled air may have heated up before it gets to the problem room. Perhaps the problem run is to a room on the South side of the house, which has a large window, catching a lot of summer heat. Chances are that your 'hot' rooms are on the second level of your home. You see, cooled air is dense and heavy. It doesn't like to flow upstairs. This is a very common problem, worsened by undersized ductwork and inaccessibility of those ducts. Particularly for upstairs cooling problems, select the largest fan you can fit and use duct diameter expanders & reducers to adapt to the ducts already in place. What boost can I expect from an In-Line Duct Fan? A standard floor or wall register is normally fed by a 6" diameter duct. You would like to boost the airflow from that register because you have a room that is usually cold in the winter or hot in the summer. The airflow from that register may be as low as 20 or 30 Cubic Feet of air per minute. Expect this particular example to have double the airflow when an In-Line Duct Fan is installed. What temperature difference does boosted airflow make? This is dependent on a host of variables. How well insulated is the room? What heat gain in the summer through a window? How far is the register from the furnace? Is this room over an unheated garage? Etc. During the winter heating season, you need a room about 4 °F warmer than it is. To achieve this you will need 11% more airflow out of the register(s) in that room assuming that your furnace runs 60 minutes out of the hour. If your furnace runs 20 minutes out of the hour on a cold winter day, that is 1/3 of an hour. You will need 3 times the 11% or 33% boost. In most applications, an In-Line Duct Fan will boost up to 80%. Thus, well up to the task of warming up a room. How loud will the installed fan be? Suncourt fans are rated between 50-60 dBA. Please visit our Fan Noise & You information page. How much power does an In-Line Duct Fan use? Example: The DB206, 6" diameter In-Line Duct Fan is rated at 0.35 Amp. For a 120 Volt product, that is 0.35 x 120 = 42 Watt. This is the maximum motor STARTING Watts. Once the fan runs, the actual wattage is 27 Watts. Like a small light bulb. In the Suncourt product specifications section, Inductors are listed by Amperage. As a rule of thumb, running Amperage is about 60% of the listed (start) Amperage. So, to figure it out: Listed Amperage times Voltage (120 Volt) equals startup Watts. Actual running Watts are about 60% of that. What type of motors are used in Suncourt products? The electric motors used in Suncourt products are C-Frame two-pole motors, Class B, Thermally Protected, sleeve bearings and synthetic lubricant. The exceptions are the 400 Series In-Line Duct Fans which have 4-pole, Class B, Thermally Protected motors with sleeve bearings and synthetic lubricant. Can I use a rheostat or fan speed control with an In-Line Duct Fan? You can not use a rheostat. A rheostat lowers the voltage supplied to the fan motor. This will cause the motor to overheat and theThermal Protector will open, destroying the motor. A solid-state fan speed control can be used. Suncourt sells two versions of a solid state fan speed controller. The VS100 is a hardwire version that is mounted in your wall similar to a light switch. The VS200 is a plug-in model that plugs into an outlet then the In-Line Duct Fan is plugged into the variable speed switch. What does Thermally Protected mean? A thermally Protected motor contains a fuse that will cut off power to the motor should the motor temperature exceed a safe limit. All Suncourt electric motors are Thermally Protected. What are the fan blades made of? The 4"-8" In-Line Duct Fan are equipped with Polycarbonate fan blades. (A high strength superior material as used for jet fighter canopies). The 10"-14"In-Line Duct Fans have aluminum fan blades. How many Inductor fans can I install? We recommend that you do not install more than 2 In-Line Duct Fans per 8 registers in your air distribution system. Two boosters will not appreciably affect the airflow to the remaining registers. If you install more than 2 In-Line Duct Fans per 8 registers, you may be lowering the airflow from a register in some other room in your home, thus creating temperature problems there. Will an Inductor always double airflow from any register? No. An In-Line Duct Fan will boost airflow more to a poorly performing register (which is the register needing help) than to a register that already has good airflow. As stated before, a poorly performing register may have double the airflow with an In-Line Duct Fan. A well performing register may have a 30% to 50% percent increase in airflow. What is the difference between Free Air and Boosted Air? Free air is the air volume output from a fan, expressed in Cubic Feet per Minute (CFM) when the fan is not connected to any ductwork, pipes, louvers or other items that would interfere with the free flow of air from the fan. Boosted Air is the maximum airflow that can be passed through an In-Line Duct Fan in CFM before this fan, installed in a duct, becomes a hindrance to airflow rather than boosting an existing airflow. Depending on the specifics of the electric motor and fan blade combination, Boosted Air can be between 50% to 100% greater than Free Air. Can I "over boost" a register? Suncourt In-Line Duct Fans are designed to provide progressive boost. This means that the airflow is proportionally boosted to the need of a particular register. Our booster fans are designed to run at a low RPM in free air. At this RPM, the fan motor runs below the peak torque that can be generated by the motor. Depending on the air blown into the intake side of the In-Line Duct Fan, the RPM will adjust itself as needed to provide boost and will operate at or near peak torque of the electric motor. In what type of duct can I install an In-Line Duct Fan? In-Line Duct Fans are suitable for installation in metal, flexible or high density pressed fiberglass ducts. The In-Line Duct Fan can be secured to the duct with screws or a good quality duct tape. Can I build-in an In-Line Duct Fan, i.e. drywall or panel over it? No. The In-Line Duct Fan must always remain accessible for service, cleaning or repair. Can I use the In-Line Duct Fan to vent outside air? The In-Line Duct Fan has to be protected from rain and excessive moisture. What is the lowest airflow temperature for an In-Line Duct Fan? To maintain good oiling of the motor bearings, we recommend a minimum temperature of 40°F (4°C). What do I typically need for electrical installation? You will need a small electrical box to mount on the In-Line Duct Fan. We recommend #8 self-piercing or self-drilling sheet metal screws, ½" to 5/8" long. Do not pre-drill the electrical box mounting holes. Be sure these screws do not touch the fan blade or the electric motor. For this box you will need a power supply strain relief to mount in a "knockout" in the electrical box. Choose the power cable to conform to the applicable codes and standards. The staff at your favorite Home Center can recommend these materials to you. Where do I get power from for the In-Line Duct Fan? Here you have a number of options. The easiest way to power your In-Line Duct Fan for automatic ON/OFF operation with both your furnace and air conditioner is to use the Suncourt DuctStat. Please view the DuctStat section of these FAQ's. You may power the In-Line Duct Fan via a standard wall switch for manual ON/OFF operation. Running an In-Line Duct Fan continuously will not appreciably affect the life of the fan. The next best is to connect to the wiring of your furnace. You must connect to the wire that provides power to your furnace blower. Consult the furnace wiring diagram, usually located on the inside of the panel covering the main furnace blower. Again make sure that all wiring conforms to all applicable standards and codes. Also check that your furnace blower motor has a 110-120 Volt AC motor. Some larger furnaces have 220-240 Volt AC motors. Some of the newest high-end furnaces have DC motors. Do not connect the In-Line Duct Fan to either the 220-240 Volt AC or the DC type. Because of the numerous variations in furnace wiring, Suncourt cannot advise you on the hookup. Can I wire my two-speed In-Line Duct Fan to run on High or Low speed? Yes, but first this warning. NEVER connect the High and Low speed wires together. The motor wiring will burn out in a matter of seconds, permanently destroying the unit. Wire to operate either on High speed or Low speed. Never both. You may use a Single Pole, Double Throw "ON-OFF-ON" toggle, rocker or other switch to wire for High or Low speed operation. This switch must be rated for 125 Volt AC, 10 Amp minimum. Now you can switch your 2-speed Inductor from High to Low speed and have a center OFF position. Connect the supply power to the C (common) terminal, the High speed wire from the motor to the terminal marked 1 and the Low speed wire from the motor to the terminal marked 2. Make sure that the wiring and enclosure for this switch conform to all applicable standards and codes. Is the In-Line Duct Fan safe? The In-Line Duct Fans have been rigorously tested to the Standards of Underwriters Laboratories Inc. and are listed by Intertech Testing, ETL® (C/US). All Inductors have Thermally Protected electric motors.